Alveolar echinococcosis (AE), caused by the metacestode stage of the fox tapeworm Echinococcus (E.) multilocularis, represents one of the most severe parasitic zoonoses in the Northern hemisphere. The tapeworm is usually perpetuated in a sylvatic life cycle which includes foxes (Vulpes vulpes) as final hosts and various rodent species as intermediate hosts (Eckert and Deplazes 2004). However, humans and non-human primates may also acquire the infection through accidental ingestion of E. multilocularis eggs (Ammann and Eckert 1996; Brack et al. 1997; Bacciarini et al. 2004; Tappe et al. 2007). In these aberrant intermediate hosts, AE is characterized by a chronically progressive and malignant liver disease which gradually affects adjacent organs and is usually fatal without timely initiation of an adequate therapy (Ammann and Eckert 1996; Kern et al. 2006; Tappe et al. 2007). In the Old World monkey breeding colony of the German Primate Center, a total of 23 cases of spontaneous AE have occurred between 1994 and 2014, affecting 14 cynomolgus macaques (Macaca fascicularis) and nine rhesus monkeys (Macaca mulatta). Diseased animals had to be euthanized due to severe metacestode infiltration of the liver and other organs. Serological screening revealed a high prevalence of anti-E. multilocularis antibodies, especially among cynomolgus macaques, raising concerns about new cases and reflecting a continuous infection pressure. It has long been recognized that specific immune reactions of the intermediate host are capable of killing the oncosphere stages of various cestode species. In contrast, neither intestinal adult stages of E. multilocularis nor larvae, which are surrounded by a protective laminated layer by day 14 post infection (p.i. ), can be eliminated by the immune system (Craig 2003; Gottstein 2005). Therefore, the objective of a vaccination against AE is to induce a protective immune response against an establishing oncosphere at an early stage of infection (Gottstein 2005). In different rodent models for cestode infections, immunization with recombinant proteins provided an effective protection against subsequent challenge infection (Ito et al. 1991; Manoutcharian et al. 1996; Müller-Schollenberger et al. 2001). One of the most promising antigens for the vaccination of intermediate hosts against the fox tapeworm is the protein Em14-3-3. The overexpression of this protein in the germinal layer of E. multilocularis is considered to lead to excessive proliferation of the metacestode (Siles-Lucas et al. 1998; Siles-Lucas et al. 2001; Siles-Lucas et al. 2003). Parenteral vaccination of BALB/c mice with recombinant Em14-3-3 (E14t) provided 97 % protection against primary (oral) challenge infection with 2000 E. multilocularis eggs (Siles-Lucas et al. 2003). Considering the ongoing problem of AE at the German Primate Center, the question arose if vaccination of the non-human primates represents a useful prophylactic approach to prevent infection with the parasite. Therefore, as a first step, the aim of this pilot study was to investigate whether vaccination with the recombinant antigen Em14-3-3 is safe and immunogenic in rhesus monkeys. The study included six 17–21-year-old female rhesus monkeys (Macaca mulatta) from the breeding colony of the German Primate Center, Goettingen, Germany. Care and housing conditions of the animals complied with the regulations of the European Parliament and the Council Directive on the protection of animals used for scientific purposes (2010/63/EU). All procedures performed in studies involving animals were in accordance with the ethical standards of the German Primate Center. Collection of blood samples for serological testing, physical examination, and administration of the vaccines were carried out under anaesthesia with a mixture of 5 mg ketamine hydrochloride (Ketavet® Pfizer, Karlsruhe, Germany), 1 mg xylazin hydrochloride (Rompun® TS, Bayer, Leverkusen, Germany), and 0.01 mg atropine sulphate (Atropinsulfat, Dr. Franz Köhler Chemie GmbH, Bensheim, Germany) per kg body weight. Serological testing of all six animals was carried out prior to vaccination by means of Em2-ELISA (Bacciarini et al. 2005; Rehmann et al. 2005; Gottstein et al. 1993) and Western blot (Mueller et al. 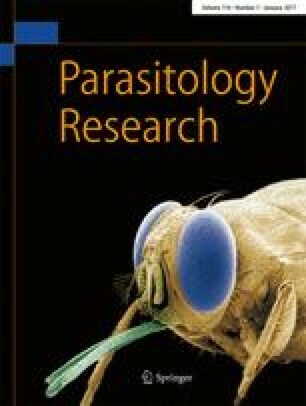 2007) for antibodies against E. multilocularis, to rule out any potential contact with the parasite for these animals before starting experiments. For post-vaccination monitoring of vaccine-specific immune responses, a rec14-3-3-ELISA was performed. This ELISA was basically carried out as reported earlier for a mouse study (Siles-Lucas et al. 2003), except that the anti-mouse-IgG-alkaline phosphatase conjugate was replaced by the same anti-monkey conjugate as used for the above mentioned Em2-ELISA. The recombinant E. multilocularis 14-3-3 protein used represented 60 % (C-terminus) of the corresponding E. multilocularis full-length metacestode protein (Siles-Lucas et al. 1998). Production methodology and purity level of the recombinant 14-3-3 antigen were identical to that previously used for mice (Siles-Lucas et al. 2003). Five rhesus monkeys were vaccinated with the purified recombinant Em-14-3-3, a sixth animal served as negative adjuvant control (Table 1). In order to evaluate the immunogenicity of the antigen and the safety of the selected adjuvant Quil A® (InvivoGen, Toulouse, France), only one animal (13698) was initially vaccinated. The vaccination schedule comprised one initial and two subsequent booster vaccinations on days 14 and 28. A volume of 1 ml of the vaccine was administered subcutaneously into the upper arm. The five remaining animals were then divided into three groups (Table 1). For two animals, alumimium hydroxide (alum) (Serva, Heidelberg, Germany) was selected as adjuvant; a total volume of 0.5 ml of the vaccine was applied. In the second group, muramyl dipeptide (MDP, N-Acetyl-Muramyl-L-Alanyl-D-Isoglutamin; InvivoGen, San Diego, USA) was administered as adjuvant with a total volume of the vaccine of 1 ml. One animal received 670 μl of a mock vaccine containing only MDP, serving as an adjuvant control. The administration site was identical to animal 13698 for all groups, respectively. For dilution, sterile pyrogen free 0.9 % NaCl solution was used; the composition of the respective vaccines is depicted in Table 1. In order to determine the influence of the chosen interval between the initial and the booster vaccinations on immunogenicity, a different vaccination schedule than that in animal 13698 was chosen for the animals of group 1 and 2. Therefore, after the initial vaccination, the latter received the two booster vaccinations on days 28 and 84, respectively (Fig. 2). All rhesus monkeys vaccinated with the recombinant Em14-3-3 antigen developed parasite-specific antibodies, albeit at varying levels. This observation is in line with the results of previous experiments in mice confirming the immunogenicity of the recombinant Em14-3-3 (Siles-Lucas et al. 2003; Margos and Gottstein 2010). The kinetics of the antibody levels in the five vaccinated monkeys as well as in the control animal are shown in Figs. 1 and 2, respectively. The first animal (13698), which received Quil A® adjuvant, developed a focally extensive panniculitis at the injection site, which was considered a local adverse reaction to the adjuvant. Local inflammation following the administration of Quil A® adjuvant, a partially purified saponin, had previously been described, which confirmed this assumption (Kersten and Crommelin 1995; Spickler and Roth 2003; Sun et al. 2009). Although Quil A has been applied in vaccinations of macaques before (Stittelaar et al. 2002), we subsequently preferred the use of other adjuvants instead due to the potentially irritating quality of this adjuvant observed in one of our animals. Compared to the animals of group 1 (alum group), the monkeys of group 2 (MDP group) showed considerably lower antibody levels subsequent to all three vaccinations. In the control animal, which received adjuvant only, no seroconversion was observed. In group 1, the primates remained seropositive for 8 months after the second booster vaccination, whereas the antibody levels in the animals of group 2 dropped below the detection limit within two and five months, respectively. Thus, the present study underlines that the selection of the adjuvant influences not only the safety of the vaccine, but also has a substantial impact on immunogenicity. Although generally considered a relatively weak adjuvant with low resulting antibody titers (Spickler and Roth 2003), alum proved to be the most potent adjuvant in our approach. The exact mechanism of action of alum is hitherto controversial (Li et al. 2007; Kool et al. 2008; Mckee et al. 2009; Hutchison et al. 2012). Therefore, it remains elusive why antibody concentrations induced with the immune modulatory peptidoglycane MDP were considerably lower compared to the alum group. In contrast to the chosen adjuvant, the impact of the two different vaccination schedules (0–14–28 vs. 0–28–84) on the durability of antibodies appeared to be less distinct: although the animals of group 1 and group 2 received the vaccinations at identical intervals, antibodies in the alum group remained on a low level plateau until the end of the study period whereas they decreased to seronegative values in the MDP group by 4 months after final immunisation. In contrast, antibody persistence in the animal vaccinated with the Quil A® adjuvant was comparable to that of the alum group. However, due to the small group size in our pilot study, conclusions are only valid to a certain extent. In order to evaluate the efficacy of the vaccine, a challenge infection or parasite exposure of the immunized rhesus monkeys is essential. In previous studies, vaccinated mice were challenged orally with E. multilocularis eggs (primary infection) and intraperitoneal inoculation of metacestode tissue (secondary infection), respectively, with a subsequent quantitative assessment of metacestode proliferation (Müller-Schollenberger et al. 2001; Gauci et al. 2002; Siles-Lucas et al. 2003; Margos and Gottstein 2010). The seroconversion induced by vaccination alone is not necessarily a criterion for the efficacy of the immunisation. Müller-Schollenberger et al. (2001), using Salmonella typhimurium-delivered E. multilocularis glyceraldehyde-3-phosphate dehydrogenase (EmGAPDH) as antigen, demonstrated that vaccinated mice were protected significantly against challenge infection, although specific antibodies were not detectable. In contrast, despite detection of vaccine-induced specific anti-EmGAPDH antibodies, immunisation with the same antigen in a different vector system was not protective. It remained unclear if the protection was due to other antibody subclasses or cellular immunity (Müller-Schollenberger et al. 2001). Conversely, the use of recEg95 (in sheep) and recEm95 (in mice) protected the animals against a challenge infection with E. granulosus or E. multilocularis, respectively, and for both vaccines, the protective immune correlate was based on humoral immunity, i.e., appropriate antigen-specific antibody levels (Gauci et al. 2002; Gauci et al. 2005). In conclusion, our pilot study evidenced that vaccination of rhesus macaques with recombinant Em 14-3-3 antigen induces parasite-specific binding antibodies, with alum being the most potent adjuvant in terms of antibody levels and longevity. In order to evaluate the efficacy of the immunisation regimen, a challenge infection of rhesus monkeys vaccinated with the recombinant antigen is the next logical step. In light of the increasing impact of alveolar echinococcosis on public health (Gottstein et al. 2015), the development of an effective prophylactic vaccination against this zoonosis would be a great step forward in the protection of animal and human health. We would like to thank Ghalia Boubaker and Markus Spiliotis (Institute of Parasitology, University of Bern) for their excellent technical assistance, Dr. Annette Schrod (Primate Husbandry, German Primate Center) for the expert veterinary support, Prof. Walter Bodemer (Pathology Unit, German Primate Center) for his valuable advise and helpful discussion during preparation of the manuscript, and Shereen Peterson (Unit of Infection Models, German Primate Center) for the linguistic revision of the manuscript. We are also grateful for the support by the Swiss National Science Foundation (31003A_141039/1). This work was supported by the Swiss National Science Foundation (31003A_141039/1). All applicable international, national, and/or institutional guidelines for the care and use of animals were followed. All procedures performed in studies involving animals were in accordance with the ethical standards of the institution were the studies were conducted.